The childhood friendship turned into a relationship that went on to marriage followed by a divorce, not once but twice. Kimberly Anne Scott, famously known as Kim Mathers during her time with Eminem is his childhood love. They have three daughters together, they have a great childhood story to Share. In this article, we will try to discuss about the on and off relationship Eminem had with Kimberly Scott. Kimberly Anne Scott is a childhood friend, a long time Eminem’s friend and mother of Eminem’s children. She was even arrested back in 2001 when cops caught her overspending. Later she was found with two bags that had white materiel, suspected to be cocaine. Drugs, abuses and a bad neighborhood was all that had a huge impact on Kim’s life. She was born on January 8, 1975 and had a sister Dawn Scott. The sisters’ bond was so good that they were involved in drugs together. It was when she was 13 years old, Kim and Dawn decided to run away from house, when they met Eminem. Eminem who was 15 years old decided to help them and took them to his mother’s couch. The story is completely shown in the famous movie 8 mile where Eminem has acted himself. Kim has helped Eminem a lot during his struggling time. She was he inspiration and motivation when he was struggling to establish himself as a rapper. The neighborhood had black people all around and rap to the while folks was not common. However Kim struggled all her way to help Eminem. All Kimberly Anne Scott, Eminem and her sister Dawn were in a circle where all of them were involved in Drug abuse. Kimberly could come out clean at the age of 32 and she stopped using drugs, but her relationship with Eminem got her depressed and even lead to a suicide attempt which will be discussed later on this article. Eric Hatter : Kimberly met Eric back in 2002 while she divorced with Eminem. They had a relationship and a girld named Whitney. Although the relationship did not last long, the kid Whitney Scott was later adopted by Eminem who has legal Custody of Whitney. Although Whitney is not his biological daughter, Eminem has given her his name and takes good care of his girl. 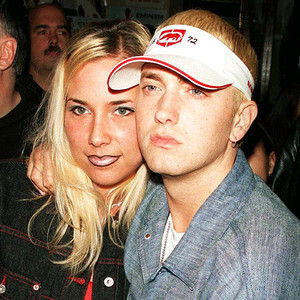 Kimberly Anne Scottt had on and off relationship with Eminem. The couple first met back when she was running away from her house along with her sister. They lived together and discovered a great bond. Five years later, their first children Hailie Mathers was born before their marriage. The couple married in 1991, however the marriage did not last longer than 2 years. They divorced in 2001. Soon, she met Eric Hatter and had a baby girl with him while she was not in relationship with Eminem. The name of the girl was Whitney Scott. Despite of the relationship and divorce, the couple marriage again, five years after their separation in 2001. After the couple married in January, 2006, the world and Eminem’s fan might have though that the relationship was meant to be and the couple would be living happily after. Although this was not the case, because the couple divorced three months later. Despite of separation, Kim says that they have a pleasant friendship and they are good friends for life. They have the custody of three children together, including a biological daughter. She says their pleasant friendship will help their children to grow a normal life. She had been clean of drugs from 10 years when she met an accident. The road accident was meant to kill her as it was a suicide attempt, Kim admitted after she recovered from the accident. She said she was drunk and had pills and she decided to take her life away. The road was vacant and it was best time for her to crash, she believed because she though the road was empty, the crash could hurt no one else but her. Kimberly Anne Scott has three children, out of which two of them are her own biological daughters who she gave birth by herself. The father of all those three children is Eminem as he has the legal custody of all those three children. Although only one of the children is Eminem’s blood, he adopted remaining two of them. Hailie Jade Scott-Mathers – Hailie was born in 1995, four years before Kim and Eminem married. She is the only daughter biologically related to both Eminem and Kimberly Scott. Her parents married when she was four years old in 1999. Alaina Marie Mathers : Aliana Mathers is actually Dawn Scott’s daughter. Dawn Scott is Kim’s sister and Eminem and Kim adopted Alaina and Eminem has full legal custody of Alaina. She is the only daughter who is not biological daughter of Kim. Whitney Scott : Whitney Scott is Kim’s daughter she had when she separated with Eminem and was in relationship with Eric. Although the relationship with Eric did not last for a long time, she had a daughter with him who was later adopted by Eminem. 1975 – It was when she was born. Back in January 9, 1975 both Kimberly and her twin sister Dawn Scott were born. 1988 – When Kimberly was 13 years old, she ran away from her home along with her twin sister Dawn and moved to Eminem’s mother place. This improved the bond with Eminem and rest is a history. 1995- She became mother for the first time as she gave birth to Hailie. 1999 – Four years after the birth of her first children Hailie, she married with her childhood love Eminem. 2001 – The couple divorced. 2002 – She became mother for the second time. This time the father was not Eminem. It was the birth of her second biological children Whitney. 2006 – This years marks two milestones in her life. It was the same year when she remarried and re-divorced Eminem. 2016 – This was the year when she tried to commit suicide. She was drunk when she met an accident which she later revealed was suicide attempt. The event was followed after the death of her twin sister Dawn whose death was because of the overdose. Dawn had a long time relationship with Kim. They were born together, they left the home together and were involved in drug habits together. Her separation from Eminem and Dawn could have lead to loneliness which might have been the reason for her suicide attempt.